An ideal solution for personal and small workgroups, this versatile print solution is designed to meet the speed and precision requirements for AEC, CAD, MCAD, ECAD, and applications, with outstanding ease-of-operation. The Canon imagePROGRAF iPF750 36″ large format printer produces vibrant full-bleed posters, clear text documents, and crisp line drawings quickly and easily. An ideal solution for personal and small workgroups, this versatile print solution is designed to meet the speed and precision requirements for AEC, CAD, MCAD, ECAD, and applications, with outstanding ease-of-operation to handle all-purpose, office projects. A totally revamped, environmentally-conscious design with fully front-accessible operations allows for outstanding ease-of-use and flush wall installation in any environment. 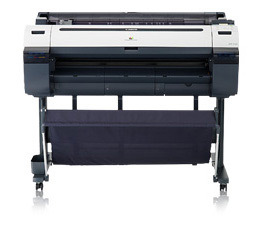 From loading paper, to navigating through an intuitive control panel, the iPF750 simplifies large format printing. And with accounting functionality, a sub-ink tank system, and Gigabit Ethernet support, this printer achieves exceptionally high measures of productivity. With on-board support for HP-GL/2 and HP RTL files, standard and HDI printer drivers, and included PosterArtist Lite, the iPF750 provides the versatility and flexibility needed to be used in a wide variety of industries and applications, all in one captivating package. Don't buy Canon iPF755 Used without contacting Napco. Call us today at 1-866-752-6766.